The American Academy of Pediatrics recommends that children under two years old have no screen time, and that older children are limited to one or two hours a day. We followed the stricter guidelines suggested by Zero to Three of no screen time under two, a 30 minute daily maximum from two to three years old and an hour maximum as children are older. The idea around these guidelines is to consider them for your family. Stop and think, how much time do your children spend interacting with screens? What are they watching or doing during that time? How do you measure the educational value of programs? How do you follow-up to what they viewed? 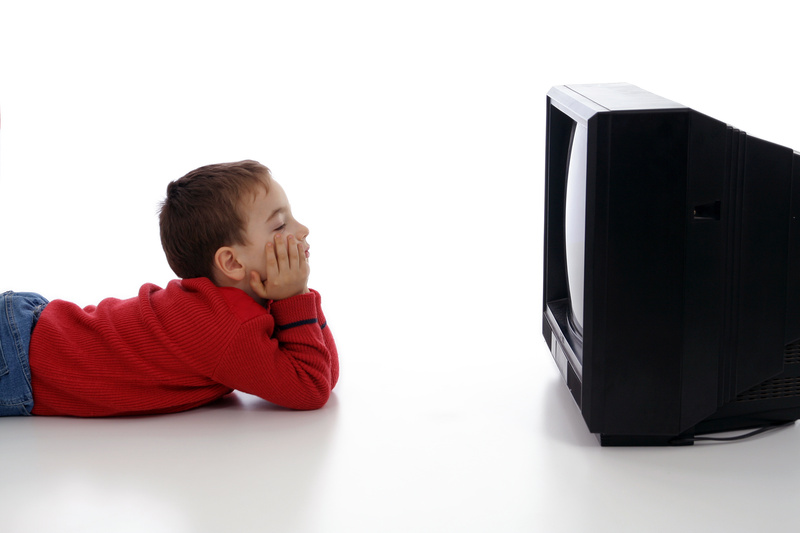 No screens in their bedrooms – 30% of three year olds, 40% of six year olds and 60% of 10 to 14 year olds have TVs in their bedrooms. This is related to more viewing time per day, more consistent weight gain relative to peers and higher rates of sleep issues. No screens during mealtimes – Children who are watching while eating tend to over eat. They are not learning to listen to hunger and fullness cues because they are distracted by the screens. This habit is tied to later childhood obesity. No screens on playdates – This should be an easy one, but encourage them to be social when their friends are over. Track it for a week – To determine if your family is at a comfortable level, start by tracking it for a week. Jot down how much time everyone in the family is on screens. Find a way to be clear – I have known families that pass out half-hour tickets on weekdays and hour tickets on weekends. The idea is once the ticket is gone, their screen time is done. This makes the expectation and the use clear for all. When my girls were in elementary school, we had the simple rule of one, 30 minute program each day, and once it was over it was over. Save screens in the car for long trips – If your child is on a screen in the car while you run errands, they may be above the recommended limits just by travel time. Join me for a valuable discussion about why to limit screen time, the impact on developing attention span, academic readiness and obesity. This will include information about background media, reading on screens and guidelines about deciding on the quality of children’s programming. My workshop on Screen Time will be on June 18th from 7:00-9:00 p.m. For more information and to register, please visit http://www.eventbrite.com/o/parenting-by-dr-rene-parenting-playgroups-283710166?s=1328924. It seems the challenge of limiting screen time is a growing concern for parents. With TV, computers, tablets and smart phones, screens seem available to our children at every turn. When a child is complaining loudly in a restaurant or crying in a waiting room, it can be tempting and so easy to pass them a screen to quiet them down. The difficulty is the little bit of research available about screen time and very young children is negative and for older children it’s questionable at best. The American Academy of Pediatrics continues to suggest that there be no screen time for children under two years old, and a one to two hour maximum for older children. Other researchers, including Zero to Three, suggest less is better with a 30 minute daily limit for two to three years old, and an hour daily limit for older children. Part of the reason for these screentime limits is to leave more time for other more valuable activities. When screen time is given to children just to quiet them down, parents are missing a golden opportunity to teach the child to calm themselves. They are missing a chance to build empathy by pointing out the annoyed people around them. Screen time as a passive activity is time children could be playing, having conversations, climbing trees, coloring or reading books. Part of the reason is the growing research that supports links between higher rates of viewing with childhood obesity, attention span concerns and later depression. My children watch tv and as they are getting older they have their own phones. The idea is to make sure you educate yourself as a parent and make the decisions that fit your family. For more information on this topic, read Screen Time: How Electronic Media – from Baby Videos to Educational Software – Affects Young Children by Guernsey.